meals at home: I think I'm in love! 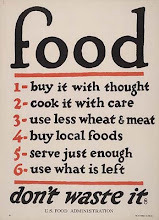 Please, whatever you do, make this meal as soon as possible! It might seem like a complicated and time-consuming process, but I assure you that an en papillote dish couldn't be easier. 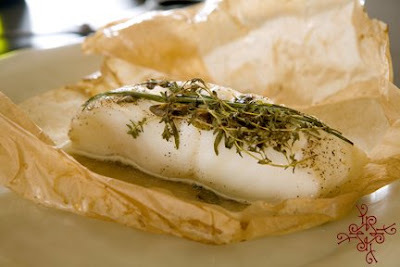 Basically, en papillote is a cooking method in which an item is sealed in parchment and cooked in the oven. The trapped steam cooks the food, while its juices and flavour are retained within the parchment. Your guests will be most impressed as they tear open the packets of steaming goodness. I haven't done anything en papillote since culinary school and I wasn't sure I remembered the technique. I vaguely recalled that I needed to cut the parchment paper into a large heart-shape, (I channeled those valentine cards I made in grade school), place the fish to one side of the crease and seal it back up. That's the jist of the work that goes into this kind of fish preparation. Believe me, it is a wonderful and dramatic way to present your fish and it has an added bonus of easy clean-up. Prep ahead of time and put on a sheet pan in the fridge and enjoy a simple meal when you're ready - pop in the oven for less than 20 minutes. 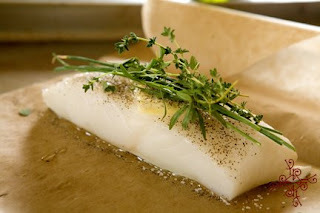 I originally planned to use halibut, but Whole Foods had Chilean Sea Bass and I really love cooking with this fish. It's slightly sweet with a meaty texture that will hold together with all cooking techniques. You can use any fish, however I like Chilean Sea Bass because it's hard to goof. 1 1/2 lbs. centre cut Chilean Seas Bass, cut into 4- 6 filets. A few sprigs of fresh herbs: tarragon, chive, oregano work nicely. Rinse and pat fish dry. Set aside. Prepare parchment. Tear off as many pieces of parchment paper as you have filets. Each piece should be about 15 inches long. Fold each piece in half and cut a half heart, but don't make the curve too sharp. Think of an oblong heart. Set aside. Place one filet to one side of the crease in the parchment. Add 1 TBLS each of wine and butter top with a few of each herb. Season with salt and pepper. Seal the paper by folding heart over trying to get the sides to meet. Start at the pointy end of the heart and begin to fold inward the top and bottom, working up the curve. It will hold its shape. It doesn't have to be completely sealed, but the less steam that can escape, the better. Place on a baking sheet. Bake for 17 minutes - serve immediately. Serve with wild rice or oven-roasted potatoes and a simple herb salad. Yvette Roman Photography, © 2008.